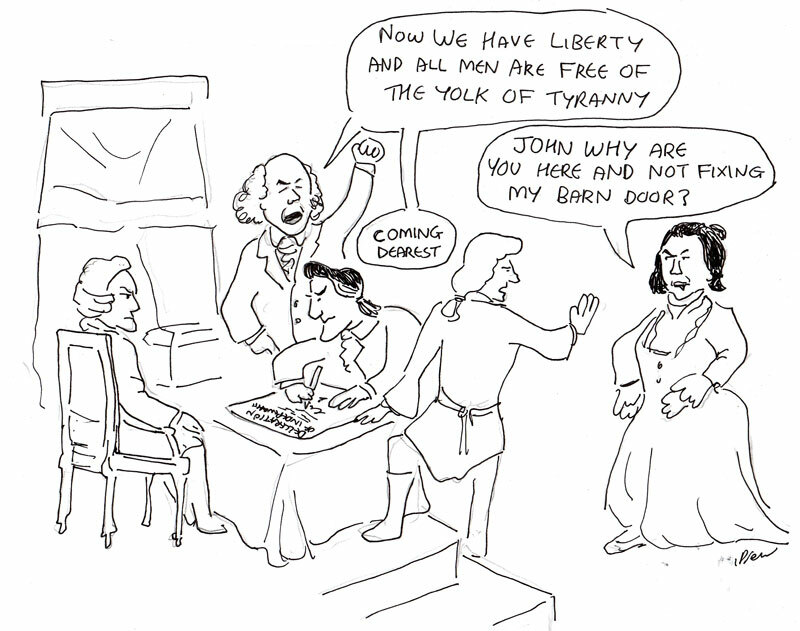 It's the 4th of July so here is another Independence Day cartoon drawn between long overdue DIY tasks. Again apologies to any Americans or students of American history if I have not quite represented events as they occurred (my reference is the TV series John Adams). History is always taken out of context and interpreted by modern readers accordng to their culture and sensibilities. Therefore it is often possible to read more into documents like the Declaration of Independence and the English and Scottish equivalents the Magna Carta and the Declaration of Arbroath than the authors intended. They are all significant documents that put their authors and signatories in danger but only in hindsight can they be viewed as the birth certificates of their respective countries. The forefathers of modern free, democratic citizens were not like us. They were rich and powerful elites, nobles, barons, business men not all elected by the people they represented. As societies became more complex families gave way to tribes with chieftains who formed nations with kings. Then as kings realised their power was dependant on the rich nobles below them who owned land and resources parliaments and assemblies were formed where both parties struggled for supremacy. Even when the parliaments gained the upper hand it took centuries before officials were elected by the whole population and not just those of a certain status, wealth, gender or colour. These documents were a product of the politics of their times and the grievances of a few powerful men against their rulers King George III, King John or Edward I. Some achieved their aims while other interest us as we look back at the history of nations to see when the first sparks of independence began.